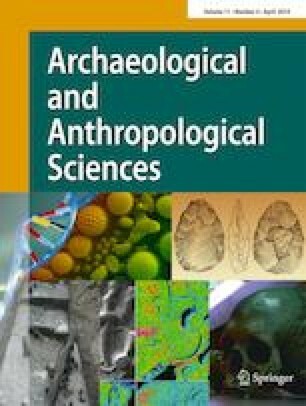 This study examines the effects of cellulose nitrate application and subsequent removal on stable isotope values in modern mammal bone which may be altered by addition of the consolidant in older museum archaeological and paleontological collections. Cellulose nitrate in the form of Duco cement was applied to modern whale and seal bones. Both treated bone and untreated controls were soaked in 100% acetone to remove cellulose nitrate and test effects of acetone on stable isotope values. Stable isotope values were measured in bone collagen (δ13Ccollagen, δ15Ncollagen) and bioapatite (δ13Cstructural carbonate, δ18Ostructural carbonate, δ18Ophosphate). The δ13Ccollagen, δ15Ncollagen, δ13Cstructural carbonate, and δ18Ophosphate values were unaltered by application of cellulose nitrate or exposure to acetone. The δ18Ostructural carbonate values were altered by exposure to cellulose nitrate in an unpredictable manner, most likely due to exchange of hydroxyl groups with differing isotope values. Care should be taken when using δ18Ostructural carbonate values from cellulose nitrate-treated bones as they may not represent an original isotope signature. Fourier transform infrared (FTIR) spectroscopy detected cellulose nitrate in all samples treated with the consolidant, including traces in bones soaked in 100% acetone (48 h) to remove it. This indicates that our procedure was not entirely adequate to fully remove cellulose nitrate. Although remnants of cellulose nitrate in treated bones apparently did not alter the isotope values, it is hereby suggested that future attempts to remove cellulose nitrate from bone include additional soaks or possibly sonication. The authors wish to acknowledge MCI Stable Isotope Mass Spectrometry Laboratory and MCI Organic Laboratory for analytical support; R. Kaczkowski and O. Madden for consultation and project advice; and two anonymous reviewers for their comments and assistance with improving this manuscript.